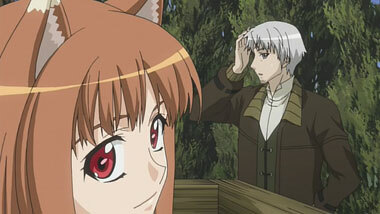 What would you do if a girl with wolf ears and tail suddenly appears at your ride? Would you leave her behind or would you take her on with you? 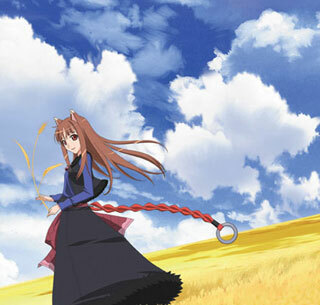 This is the situation how Holo and Lawrence meet; these two unlikely god and mortal become companions on the long road ahead. 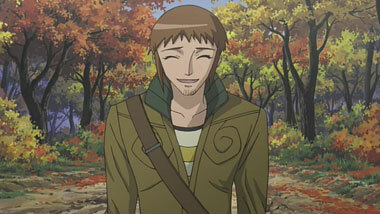 With the identity of Holo as a god of harvest, there is going to be unforeseen challenges that Lawrence must face. 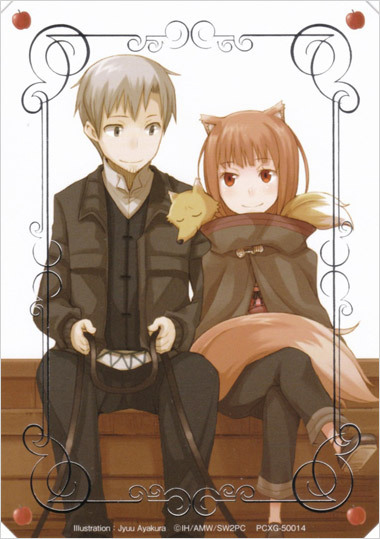 Spice & Wolf is set during the medieval times, when persecution was rampant, if the thinking and actions of people didn't adhere to the church. The first volume didn't speak much about many issues, other than a fast lesson on the economic structure of how medieval society operates with trade and barter or supply and demand. With an unfamiliar mellow journey come richer life experiences. Readers who enjoy stories where there is adventure and a cute girl, similar to the tune of Samurai Champaloo would enjoy a story like this. There has been a procession of titles that have had origins in other mediums other than a manga. 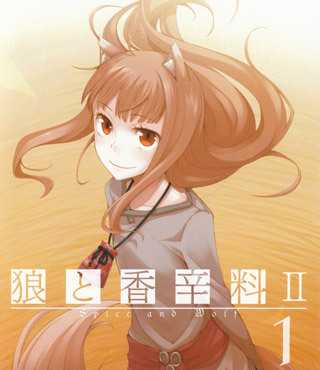 Spice & Wolf had its origins from light novel inspirations, which are chapter books in Japan meant for teenagers. 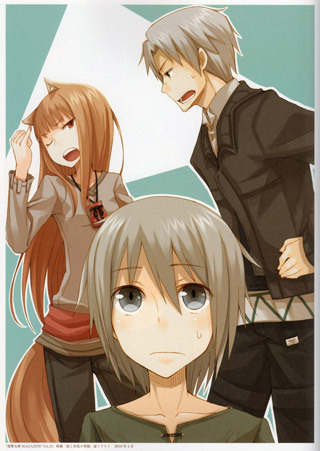 Yen Press had picked up both the manga series and the light novel series to be translated in the United States. This is a choice for the reader on either more visual or more text to consider this series. There has been a six volume ongoing manga adaptation, to the 17 volume concluded light novel series. Lawrence Craft's life was tough enough without the wolf goddess he found in his wagon. He's a traveling merchant buying low and selling high in and around a European society just this side of medieval. The church is showing its might everywhere he looks. The old, pagan ways are being swept away in favor of the all-mighty organized religion. This could be trouble for independents. Lawrence Craft needs to watch his mouth, and keep a low profile. That's not going to be easy with Holo in tow. She showed up just as Lawrence was leaving the village of Pascoe. They used to pray to her over there. She responded by providing them with a healthy harvest of wheat. That changed with the influx of missionaries. (New techniques of cultivation helped out as well.) Now Holo is considered nothing more than a superstition, a silly game to play around the bushels. Lawrence Craft is given a request from a god. Could she stick around with him for awhile? Hitch a ride with him and check things out? He knew she was trouble from the start. Still, he didn't have the guts to look at those large eyes of hers and say no. She's going to get him into a whole lot of trouble. (He could be expecting the Spanish Inquisition.) It's going to be a long, strange trip, and Lawrence Craft knows it. 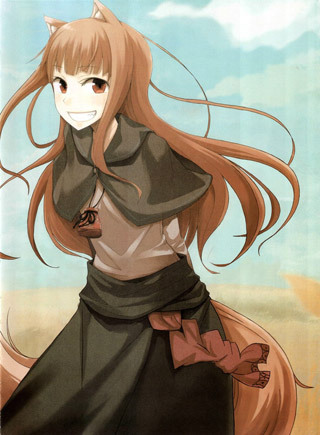 Spice and Wolf began life back in 2006 as a series of light novels by Isuna Hasekura. The manga adaptation premiered in 2007, and sports terrific art by Keito Kome. There is talk that Kadokawa USA will release the anime series in English. 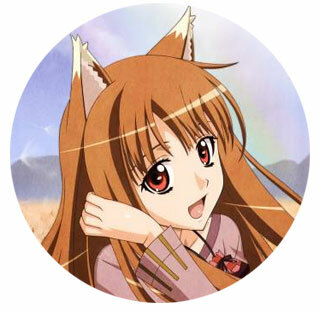 Clever little Holo is a smash hit over in Japan. She's poised to take on America. Will the states go for this "Lone Wolf and Larry"? Will ours be the market that cried Wolf? 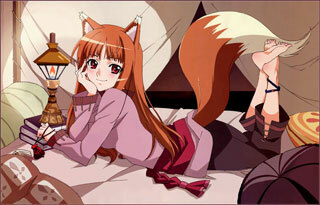 Below: Scenes from Spice & Wolf. 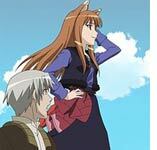 Below: Promotional artwork for Spice & Wolf.